ALL NEW STYLING - SAME GREAT PERFORMANCE AND HANDLING The all new VIPER has been designed from the ground up exclusively for the new 2012 Honda Goldwing 1800. It captures Honda’s new styling changes and incorporates a perfect match of the LED trike tail lights to the Goldwing tour box lights accented with a trunk door spoiler light as a standard feature. The trunk door has been made wider for easier access and opens to the largest trunk storage area of any trike in the industry – 8 cubic feet. At its core, a race-honed, fully independent suspension system crafted largely from weight-saving aluminum, smoothes the roughest road, while providing responsive handling to the driver. Mono shock design and race blades work together to control body lean and keep the trike flat through the most demanding curves and our proprietary brake caliper (patent pending) and fully integrated link-brake system deliver unmatched braking power and control. At the same time, our independent suspension delivers a soft, cushy ride to both passenger and driver, making every mile more enjoyable. Add the Power Trak 1800 to create supreme steering feel and control. QA1-300 lb. linear wound racing spring designed to accommodate a loaded weight of up to 650lbs. Truly masterful engineering went into the design of California Sidecar Trike's disc brake system and the result is truly confidence-inspiring braking performance. The brakes are completely integrated with the O.E.M Linked Braking System and we are the only trike manufacturer to offer full ABS integration. Check out our Performance Brake Upgrade option. The Viper comes standard with 5-spoke Vision wheels with a sharp silver powder coat finish. Optional Chrome Wheel Upgrade available. The 205/60R15 All Season radial tires provide the highest level of performance and control in all riding conditions. Optional OEM matching Chrome Directional Wheel available. Wheels are 15 x 6.5in, ET30, 5 on 100mm bolt pattern. In typical California Sidecar Trike fashion, we've crafted a body with an aggressive, sleek style that perfectly complements the GL1800 Goldwing. The body is equipped with Honda taillights, halogen reverse lights, and rear chrome trim accent strip. Eachpainted body comes with the finest finish in the business. Our in-house fiberglass and paint departments insure the highest degree of quality control and the color match capability is unsurpassed. At California Sidecar we use the same paints and clears supplied to Honda. Bodies are wet sanded and then polished in a two-step process to achieve an amazing paint finish. Ground Effects tested to hold over 700 lbs. 3 year/50,000 mile limited warranty includes parts and labor on material and workmanship defects. 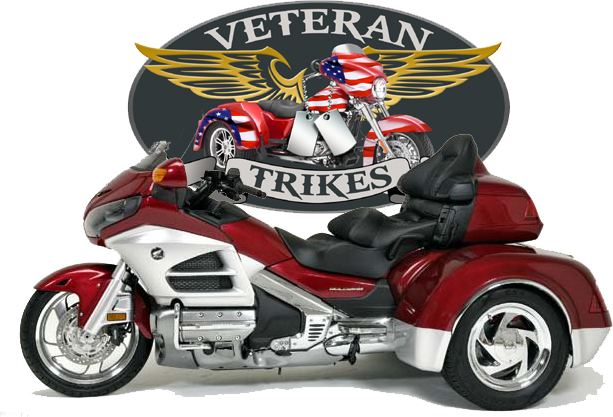 Inquire with an Authorized Dealer or California Sidecar for specific terms of the warranty.